Philadelphia Mummers Parade | Geno’s Steaks | Philadelphia, Pa. Whether you love it or hate it, the Mummers Parade is a Philadelphia staple. No one else in the country celebrates New Year’s Day the way we do. But do you know the history behind it? 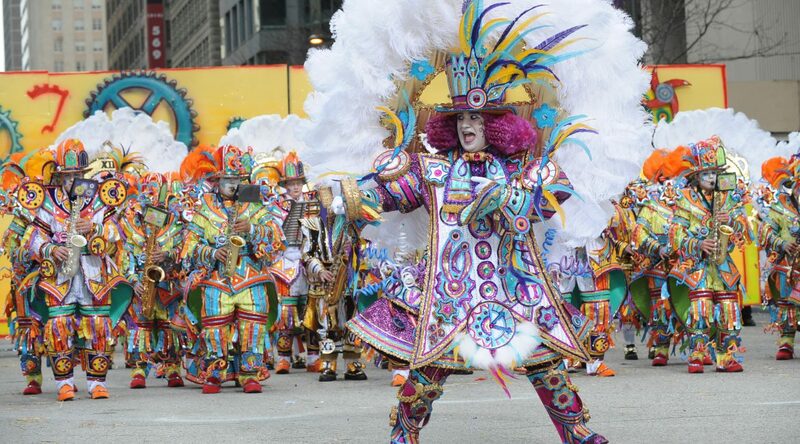 Check out this list of five things you probably don’t know about the Mummers Parade. The parade has been around since the 17th century. The Mummers Parade is based around Old World customs from many different countries and how they usher in the New Year. These celebrations in Philadelphia started in the 17th century, but they weren’t recognized as a city-wide event until 1901. Swedish immigrants started the tradition. Once the Swedes settled just outside of Philadelphia, they brought with them a tradition of visiting friends the day after Christmas. That tradition slowly crept into the whole week, and they welcomed in the New Year with masquerades, parades, songs, and more. That celebration became the Mummers Parade we know today. The costumes are pricy. The luxurious costumes not only look lavish, they are also expensive. For a 65-person troop, the total cost can be around $100,000, with the most expensive costumes costing around $10,000 a pop. It’s more than a parade. It’s a competition. Mummers don’t just parade down the street, pack up their stuff, and go home. They are awarded prizes for many different categories, including best float, group, brigade, costume, character, and more. There are four divisions. The thousands of mummers who participate in the parade each year are separated into one of four divisions: comic, fancy, fancy brigade, and string band. Each division has different rules, permissions, and attire. Comics are similar to clowns, fancies wear lavish and ornate costumes, the fancy brigade is similar to the fancies but they often perform dances and tricks with props, and the string band plays string instruments while dancing in fancy costumes. Now, go forth and dazzle your friends with your new mummers knowledge. Once the Mummers Parade finishes, come down to Geno’s Steaks and chow on your favorite sandwich!